We can only hope that if we find intelligent life somewhere in the universe that if it's dangerous we'll have a defender. A giant robot is cool, but a giant robot piloted by five individuals in five different cat robots would be awesome. Dynamite Comics explores that defense in Voltron: From the Ashes #1. The issue is written by Cullen Bunn, illustrated by Blacky Shepherd, colored by Adriano Augusto and lettered by Rob Steen. More than 200 years ago, Voltron Force fought its final battle against the Drule Empire. Voltron has not moved since that battle, but his legacy lives on. Now, an ancient enemy has arisen and a new Voltron Force must be chosen to pilot the Defender of the Universe. Voltron was one of the first major anime shows that really took off in the US, introducing legions of viewers to stateside to anime in general. Bunn taps into that nostalgia effectively in Voltron: From the Ashes #1, but he puts a unique twist on it in terms of setting it in the future. By doing so, Bunn is "claiming" this as his Voltron, giving him latitude to make some new decisions that will affect the characters. It's an approach that works, mainly because he ties the new characters into the Voltron mythos through the arrival of an old, familiar foe. Bunn also presents those new characters very cleanly, ensuring there's no confusion that this is a new group of pilots. Voltron's look is very familiar and Shepherd doesn't stray too far from the script in that regard. Voltron maintains the iconic look that made the combination of the robots famous, evincing characteristics that resemble something human. The pilots allow Shepherd to tap into the anime look, as he capitalizes on the familiar freeze-frames of character facial expressions that capture the relevant emotion. There are some strong fight scenes illustrated by Shepherd that give Voltron plenty of opportunity to showcase the true combat prowess of the robotic beast. 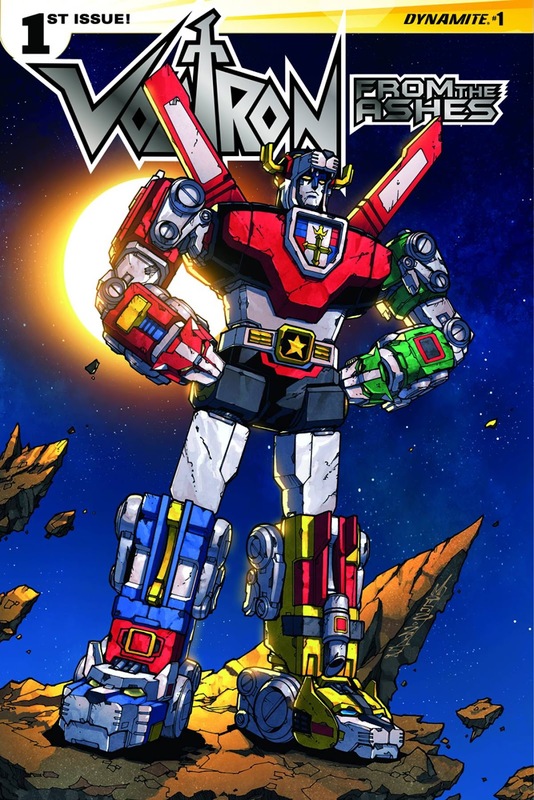 Augusto infuses the book with easily recognizable primary colors that fit the expected look of Voltron and its pilots. 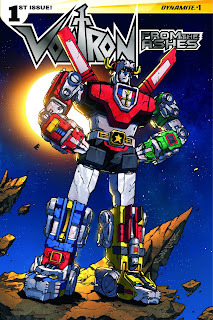 Voltron: From the Ashes #1 may occur after the series, but the general sense of action remains the same. The new pilots are just as capable as the old and Voltron maintains its ability to be a solid defender--even against familiar foes. Bunn takes the property in a great direction, introducing readers both new and old to a new chapter in the Voltron universe that taps into the property's nostalgia. Shepherd uses interesting panel insets that evoke comparisons to the anime, yet still maintains a familiar look. Voltron: From the Ashes #1 is a great first issue that readers feeling a little nostalgic will want to check out. Voltron: From the Ashes #1 is in stores now with interiors below.